Thoracoscopic sympathetic surgery is nowadays a broadly accepted technique in the treatment of primary hyperhidrosis as well as facial blushing. The objective of this study was to compare the two currently most commonly used methods for thoracic sympathicotomy: transection (ETS) and clipping (ETC.). 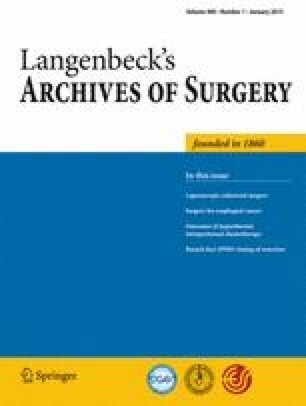 This is a retrospective study on a total of 63 patients, who underwent rib-oriented sympathicotomy, either by transection (n = 36, 57 %) or by clipping (n = 27, 43 %). Moreover, the up-to-date international literature is reviewed concerning which level(s) of the sympathetic trunk should be addressed, depending on the patients underlying condition. Furthermore, the highly controversial topic of reversibility of sympathetic clipping is debated. Our results confirm that clipping is at least as effective as transection of the sympathetic chain in the treatment of hyperhidrosis and facial blushing. Furthermore, the analysis of all larger studies on unclipping in humans shows a surprisingly high reported reversal rate between 48 and 77 %. Depending on the symptoms of the patient, different levels of the sympathetic chain should be addressed. When a higher rib level such as R2 is approached, which more likely will result in moderate to severe compensatory sweating, clipping should be preferred as it seems that this technique has indeed a potential for reversibility. As demonstrated, this method is at least as effective as an irreversible transection of the sympathetic chain. Kocher and Taha were responsible for the study conception and design and acquisition, analysis, and interpretation of data. Ahler was also responsible for the acquisition, analysis, and interpretation of data. Kocher and Schmid were responsible for the drafting of the manuscript, and Schmid was also responsible for the study conception and design, analysis and interpretation of data, and critical revision of the manuscript.